Rattrista non poco la notizia della scomparsa pochi giorni fa del batterista Tony Levin, settantun anni appena compiuti, autentico maestro dello strumento e protagonista di molte importanti stagioni del jazz britannico. Ne ricordano il talento e l'animo gentile amici allievi e colleghi in Birmingham Jazz, All About Jazz e Facebook mentre The London Drum Jazz Café riporta un nota della moglie, Chris. Al sito http://tonylevin.org (ma anche in Vimeo) sono pubblicate tra i molti materiali in via di riordino alcune sue recenti interviste, mentre un passaggio dal suo ultimo concerto - lo scorso 19 gennaio a Leicester, con il Peter King Quartet - si vede in http://tinyurl.com/6eo2dkp. Tony Levin, the internationally respected free jazz drummer, has died aged 71 on 3 February. He recently undertook a British tour to celebrate his 70th birthday with a trio featuring pianist Aki Takase and bassist John Edwards and with his old friends from the seminal quartet Muijcian, Paul Dunmall, Keith Tippett and Paul Rogers. 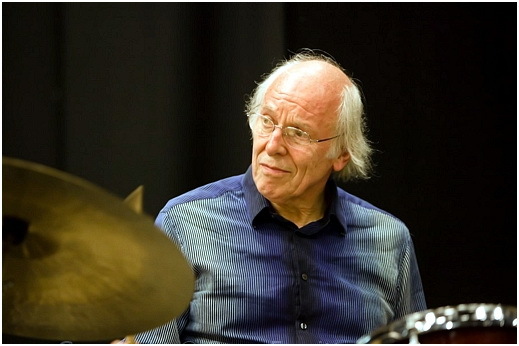 Born on 30 January 1940 in Much Wenlock, Shropshire Levin was a widely respected jazz drummer playing at Ronnie Scott's Jazz Club in the 1960s with artists including Joe Harriott, Al Cohn, Harry "Sweets" Edison, Zoot Sims, and Toots Thielemans. His first major break came when he joined Tubby Hayes' Quartet (1965-9). He worked with numerous groups and artists, including the Alan Skidmore quintet (1969), Humphrey Lyttelton band (1969), John Taylor Trio & Sextet (1970s), Ian Carr's Nucleus (1970s), Stan Sulzmann quartet, Gordon Beck's Gyroscope, duo with John Surman (1976), European Jazz Ensemble, Third Eye (1979), Rob van den Broeck (1982), Philip Catherine's trio and quartet (1990s), Sophia Domancich Trio (with Paul Rogers, double bass; 1991-2000), Philippe Aerts trio and quartet (2000s). He also played on an ongoing basis with bass player Ali Haurand in many different groups. From 1980, Levin worked extensively with saxophonist Paul Dunmall, including as a member of the Quartet Mujician, with Paul Rogers (double bass) and Keith Tippett (piano). In 1994, Levin released his solo album Spiritual Empathy, again with Dunmall on saxophones. In 2006 he played a trio gig with Dunmall and Rogers featuring Ellery Eskelin, Ray Anderson, Tony Malaby as guests at John Zorn's The Stone in NYC. He later recorded with Dunmall with his son Miles Levin on drums. Levin ran his own monthly club in Birmingham, and often performed duets with Paul Dunmall and guest musicians as well as producing records for his label Rare Music. He will be sadly missed.